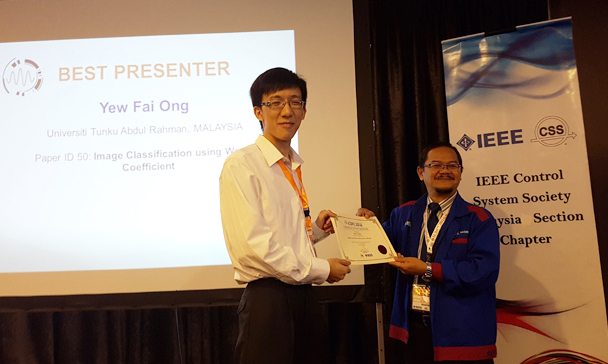 A team of researchers from UTAR Faculty of Engineering and Green Technology (FEGT) won the Best Presenter award in the 2016 IEEE Conference on Systems, Process and Control (ICSPC 2016) held at Swiss Garden Hotel in Malacca from 16 to 17 December 2016. The team comprised Dean of FEGT Assoc Prof Dr Yap Vooi Voon, Head of Master of Engineering Science programme Assoc Prof Dr Humaira Nisar, and FEGT’s Master of Engineering Science student Ong Yew Fai. Their paper, titled “Image Classification Using Wavelet Coefficients for Video Surveillance”, won the Best Presenter award and they received a certificate of achievement. The paper was part of Ong’s Master’s studies and was inspired by the video surveillance applications using wavelet compression and parallel processing that the team is currently working on. “Our research is related to video surveillance and we are working to develop a fast event detection method for video surveillance using wavelets and parallel processing. Through this research, we introduce a new approach to identify and classify different types of images encountered in video surveillance systems. The main objective of our study is to identify specific wavelet filters for achieving a better classification for images. In addition to that, the fundamental properties of wavelet coefficients for feature selection for image classification are investigated. Haar, Daubechies 5, Symlet 2, and Biorthogonal 2.2 wavelets have been used in this investigation and the results show that Haar wavelets provide promising results in object retrieval compared to Daubechies 5, Symlet 2, and Biorthogonal 2.2 wavelets,” explained Ong. He added, “ICSPC 2016 was an ideal platform to share our research with peers and experts from academia and the industry working in similar research fields. This is my first experience presenting a research paper in a conference held by the IEEE Malaysia Section Control Systems Chapter and we are excited to be chosen as the best presenter. ICSPC 2016 gave us access to a wider audience and an opportunity to present a portion of our research as a conference paper. The Best Presenter award proves the value of our work and refreshed the motivation for our interdisciplinary research.” Ong also expressed his appreciation to Dr Yap and Dr Humaira for their invaluable guidance and assistance. Organised by the IEEE Malaysia Section Control Systems Chapter and the Faculty of Electrical Engineering of Universiti Teknologi MARA, the conference provided an excellent platform for knowledge exchange between researchers working in areas such as automation and robotics, system identification, modelling and simulation, process control, intelligent systems, optimisation of systems, nonlinear systems, digital control, advancements in computation, algorithms for control, optimal and robust control, emerging areas, and control applications in other areas. In addition, it provided an opportunity for the participants from Malaysia and overseas to share research findings and establish networks and collaborations. The conference saw the participation of both local and international researchers. All papers were peer reviewed before acceptance.